Today we're going to start off with some basics of bookshelves and center channels. One of the biggest mistakes people make when they place a bookshelf speaker or center channel on a shelf is that they bury them in the cabinet. A lot of times this is for aesthetic reasons, but acoustically it's pretty much one of the worst things that you can do. What will happen with a speaker even an inch or two behind the front edge of the shelf, it will create reflections that will muffle the sound or destroy the image. 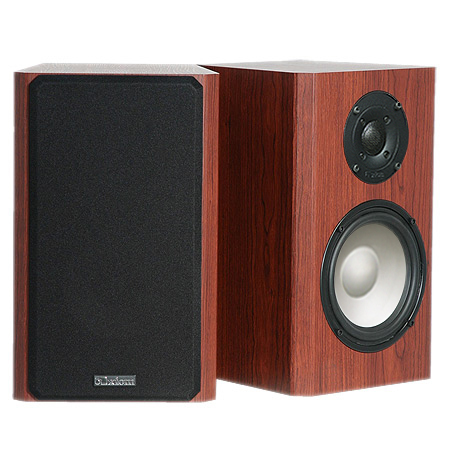 You'll get a very colored sound quality from your center channel or your bookshelf speaker. What you want to do is make sure the speaker is sitting as flush as possible or proud of the front edge of the shelf in the cabinet. This will give you far better acoustic performance. In a previous video we talked about port plugs when you've got a speaker like this M3 which has a rear port. You're going to get bass-loading from the cabinet volume behind the actual loudspeaker cabinet. If you think about it, the space in between the shelves is actually acting as another cabinet that interacts with the port on the back of the speaker. In that case you can either experiment with stuffing something in the port, or purchasing a pair of our port plugs, which will give you much smoother bass response in this position. One of the questions that was asked by one of our forum members was about height when you're positioning a bookshelf speaker or a center channel on a shelf. We tend to want loudspeakers to be at ear level, and that's always going to be the ideal. However, in many cases that's not practical for the cabinet or shelving that you have, and in the case of center channels, that would probably put the speaker right in the center of your line of sight to the television, and obviously that's no good! Now, if you need to make a compromise and move the speaker above or below ear level, then in my experience moving the speaker above typical ear level will result in a more natural soundstage and image, compared to putting the speaker lower down. Part of this is the fact that the speaker is now going to be reflecting and have some absorption from the furniture and other materials that are in the room that are typically lower down in level and closer to the floor. So that's one thing: if you can, try and get the speakers at ear level, and if not, slightly above ear level. That also applies to center channels. The convention for center channels is to typically put them in the cabinet that is below the screen, because the cabinet is holding the television set. But if you have the opportunity and a cabinet that has shelving above your television screen, trying putting the center up there. You may be surprised to find out that there's quite an improvement in sound quality by doing that. One of the other things that I want to mention is the actual center channel set up itself. 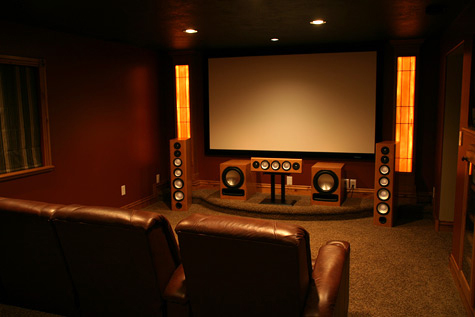 In the context of a whole home theater system, ideally set the front speakers up first as a stereo pair. Get them positioned and sounding the way that you want, and then integrate the center channel in to the system. Many times what will happen is that the center channel will actually fill out the soundstage between the left and right speaker: that's technically what it's supposed to do. So by getting the front main speakers sounding the way they should be sounding, it's a lot easier then to integrate the center channel into that. One other thing: I'm not a big fan of the automatic set-up systems and room correction systems that are found in many home theater receivers. If you're going to use one of those auto set-ups, go back and set the sound for the center channels one or two dB lower than what the auto correction system has given you. What I normally find is that center channel levels are set far too high relative to the front left and rights, which makes the center channel stick out audibly, so that it sounds like it's more forward audibly than the front left-and right channels, which is not what you want. You want an arc of immersive sound that blends also with the image that you're seeing on the screen. So there are a few simple things that you can try with the set up of your system. We'll be doing more in future videos. Don't forget to post your suggestions! Thanks for suggesting pulling the speaker out from just inside the cabinet. By doing so with my center channel speaker it made a really big difference in both sound quality and eliminating that annoying boxy, booming sound I've been bothered by for the past year or so.